Caramelized banana folded into a sweet brown sugar cake and topped with a brown sugar glaze . Bananas Foster originated in New Orleans around the 1950's. 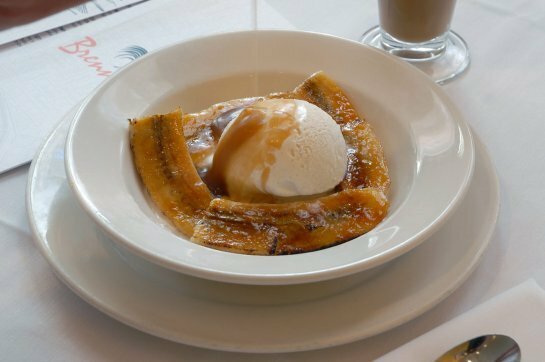 It is a simple but delicious dessert that has flambéed with rum and bananas in a caramel like sauce then it is served with vanilla ice cream. It was named after the Crime Commission at the time. When they make it at the restaurant they bring a little cart out with a hot plate with a pan of brown sugar, butter and bananas. They then add rum to it and it is flambéed. I made the original Bananas Foster at home and it is an adrenaline rush when you put the flame to the rum. This recipe you will not have to do that at all, rest assure you plus this one you can share with friends and family. 1. Preheat oven to 325 degrees. Grease and flour tube pan or Bundt pan with the 1/4 cup of flour. 2. In a medium size bowl, combine flour, cinnamon, baking powder and sea salt. Set aside. In a large bowl, cream together butter and sugar until light and fluffy, about 5 minutes on high speed. Add in eggs one at time then add vanilla extract. 3. Slowly add flour mixtures a cup at a time until fully incorporated. Set aside. 4. For bananas foster: In a medium size skillet, melt butter, brown sugar and cinnamon together. Fold in sliced bananas into the caramel sauce until coated. Slowly add rum or vanilla extract and let it simmer for 2 to 3 minutes. 5. Fold in bananas foster mixture into cake batter. Spoon into prepped pan and bake for 35 to 45 minutes. You may need to cover the top if starts to brown too fast. Stick a tooth pick into the cake to check for doneness, if it comes out clean remove from oven. 6. Let the cake cool for 20 minutes then tip over to a wired rack. Letting it cool completely. 7. In a small sauce pan on medium high, melt butter, sugar, and salt. Bring to a rolling boil then add milk and vanilla for 2 minutes and let it boil for another 2 minutes. Remove from heat and let cool for 5 minutes. Carefully whisk in confectioners' sugar a 1/2 cup at a time until smooth and thick. 8. Pour over cooled cake and let set for 30 minutes before servings. Yum! This looks so delicious. Is there a way to easily print out your recipes on one page, with black text on a white background? I'm in love with banane cake! Next thing I'll cook it's sure! Sounds like a great flavor for a cake! Looks and sounds delicious! I love the sound of those bananas folded into the caramel sauce - yum! This looks delicious! You just can't go wrong with bananas in baked goods! That cake looks so good! I love the glaze you made for it. We adore banana foster here (and the flambeing is so much fun), so this cake would be perfect for us. I defenitly would make this as a breakfast cake. I am a fan of banana cakes. I"m pinning this recipe to try for later!!!!! Oh my word! This looks awesome. 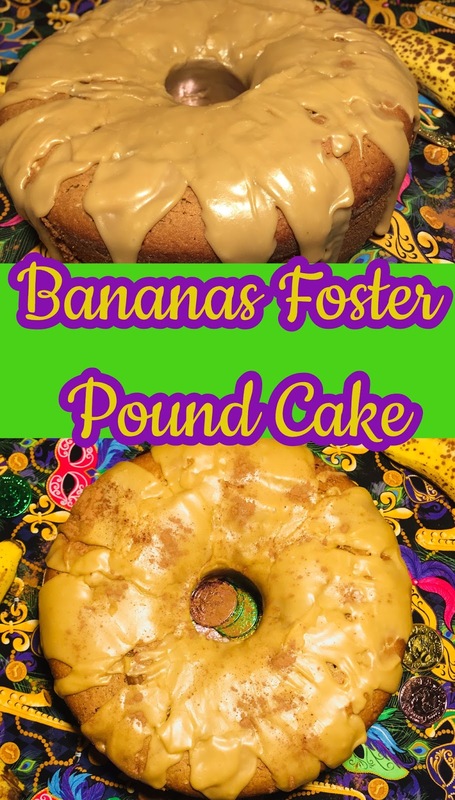 I love bananas foster, so I would love this pound cake! What a great party recipe! 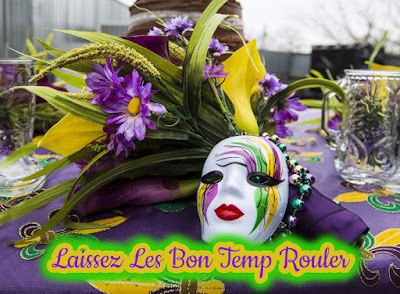 I'm going to a Mardi Gras event and will definitely try this one out. I’m sure that taste as delicious as they look! This is so good, this will be a huge hit! This would disappear in no time at our house for sure! I love the look of the glaze and it reminds me of the baked bananas my mum used to make! Giiiiirl this looks INCREDIBLE! I am saving this recipe for sure, my family will LOVE it! Wow! What a great recipe, this looks really delicious even if I haven't tasted it yet. The idea of putting banana in this cake is great. Would love to give it a try at home. do you think I can eliminate the dark rhum? do you know any alternative ingredients? Yummy! I'll have to make this for my man, he loves bananas! Thanks for sharing! I love banana bread, so this looks perfect! I have to make this. Omg that looks so amazing! Can't wait to try! OMG, ok, I think this just might be Hubby's birthday cake next summer!!! Looks and sounds absolutely divine! I love anything with Bananas! Yumm!!! Yummy! Yummy! Yummy! DEFINITELY trying this!! This looks like a gewy and delicious treat, and bananas as always good. You had me at bananas foster! So yummy! Oh my goodness, this sounds soooo good!!! I can't wait to try this! It depends on the bananas. The bananas that I used kept their shape and were still somewhat firm after carmelizing. I too have a texture thing. Look amazing, doesnt anything with banana in it taste amazing. Thanks for sharing! Oh my gosh that GLAZE!!! I love all things bananas so I definitely need to try this. It sounds so delish! yum! Delicious! I love banana bread- this totally takes it to the next level! This looks absolutely delicious. I'm a sucker for Banana. I love banana desserts, will have to try this tasty cake. Looks so sweet and delicious! I love banana everything! This pound cake looks so yummy. I like the simplicity of this recipe so much!! Oh my gosh, this looks yummy! I love banana bread so I think this would be like banana bread amplified by 1000!